By the time most people reach their early 20s, all of their permanent teeth have grown in. For many, those include a third set of molars, often referred to as wisdom teeth, that may not fit as comfortably on the dental ridges as other teeth do. Impacted wisdom teeth are third molars that can’t erupt properly because your other molars are in the way, and they’re infamous for the discomfort they cause and the frequency with which they’re extracted. 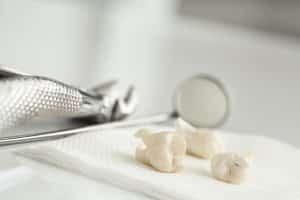 However, there’s more to know about your wisdom teeth than what common knowledge encompasses, and their secret may revolutionize modern dental and health care. Third molars actually contain knowledge—the kind of deeply-rooted knowledge that can only be found in your DNA. While researching the properties and potential of adult stem-cells, researchers discovered that inducing the activity of certain genes in adult cells biologically “reprograms” them into a stem-cell like state, where they can be guided into becoming specific tissue cells. Establishing a reliable supply of such starter cells has proven difficult, until a team of scientists from Japan’s National Institute of Advanced Industrial Science and Technology discovered a cache of mesenchymal stromal cells, or MSCs, within the pulp of extracted wisdom teeth. The tooth cells proved up to 100 times more effective at reprogramming than skin cells (a popular, more conventional source), and they exhibited the ability to differentiate into many other cell types. Unlike the rest of your teeth, your third molars are not essential to biting and chewing, and removing them won’t negatively affect your oral health. In fact, wisdom tooth removal is necessary if the molars become impacted, increasing your risks of periodontal disease. Since wisdom teeth are routinely removed, harvesting their MSCs is a more efficient and productive method of obtaining the materials necessary for stem-cell study. If you choose, you can have your wisdom teeth cryogenically frozen and stored, allowing more time for scientists to perfect their research and providing you with a stash of personal MSCs in case you ever need them. As a periodontal expert, Dr. Kania can help you determine if your wisdom teeth are impacted, or are likely to become impacted, and whether or not you should have them extracted. To learn more, schedule a consultation with Dr. Kania by calling her periodontal office in Encinitas/San Diego, CA, at (760) 642-0711.